Hello, Readers! I'm excited to have the chance to formally introduce you to our artist, Monica Schultz. 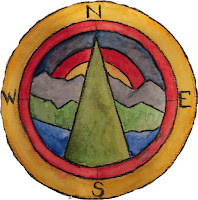 Monica painted our Lands Uncharted header scene and compass, and is working on a series of compasses for each of us who contribute to this blog. In addition, Monica has been my writing accountability partner for two years, and a neighbor and friend for over a decade. I hope you appreciate learning more about this woman of many talents! When and where did your interest in art begin? I’ve since learned that learning to draw realistically can be done by anyone – it’s just that we don’t devote the time or structure to it that we do to reading or math. If you think you can’t draw, go to the library and check out Betty Edward’s book Learning to Draw on the Right Side of the Brain. It’s an excellent curriculum for adults and children alike. So what kept you involved in art? As a student, I used art activities as a way to keep engaged and study. Even if I hated a subject, magic markers and art materials would make it study-able. I’d rewrite my notes in many colors, draw pictures, and, in an anatomy and physiology class, I sculpted bones and tried to fit them together. I disliked my statistics classes, but I loved drawing and graphing mathematical patterns – or making collages out of the many pages of printouts that were the result of statistical programming. I retained more [information] if I used colors, shapes, and form as part of my studies. Later, as a business person, I traveled with a small watercolor kit. I needed a way to “change gears” and calm down at the end of the day. A small painting before bedtime (which was often extremely late) would do it. And I sketched in many airports waiting for flights. I used art as more of a way to learn, to calm down, and to exit my analytical, over-thinking mode and come more into the present moment. I remember more if I use more colors, shape, and form. Ultimately, my interest in art is not the finished PRODUCT, but the PROCESS and what happens when I PLAY with art materials. I don’t have a favorite, by my most often used is watercolor, because it’s easily accessible, portable, fast, and I love the transparency and quality of color. (Though color quality depends upon the quality of watercolors you buy.) It’s difficult to control, so I like to think of the medium as having its [own] say and opinion about what needs to happen in the moment – not just me. I look at what’s immediately around me, but I also look to other artists. I visually scan other artists’ work for a small corner or fragment that could be enlarged into its own piece. I also love drawing animals – so give me any animal photograph and I’m happy. I find one of the most important resources for any artist is to keep a reference file handy. Just looking at pictures that spark your interest and ideas is extremely helpful. Look at style and colors that make you “wake up.” They will give you a hint of what will get you started. 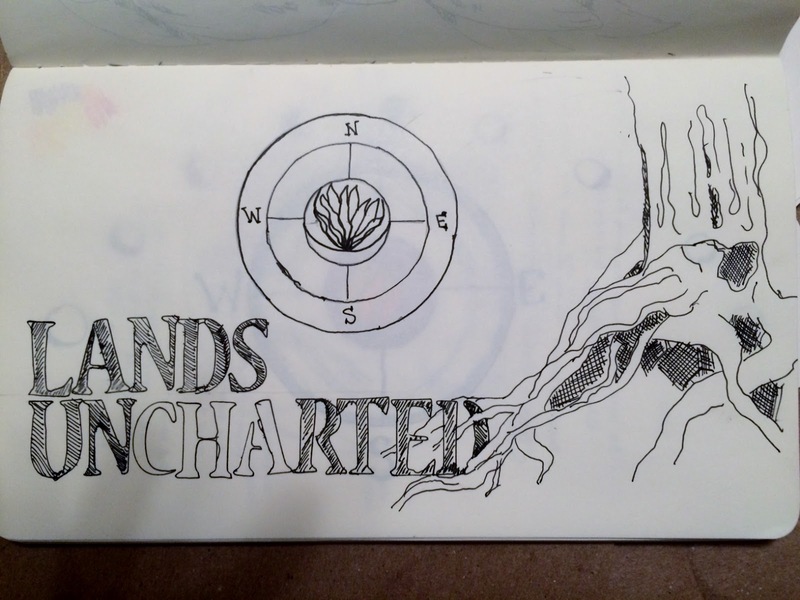 Tell us a little about your artwork for Lands Uncharted. It’s a fun work in process. My neighbor, Erin Cronin, is one of the authors of Lands Uncharted, and I was excited when I heard about it because I love children’s literature, I wanted to practice making art to fulfill the vision and expectations of someone other than me. So I asked Erin if I could try. Erin checked with the authors, and they graciously agreed. I began with the storybook header for the blog. 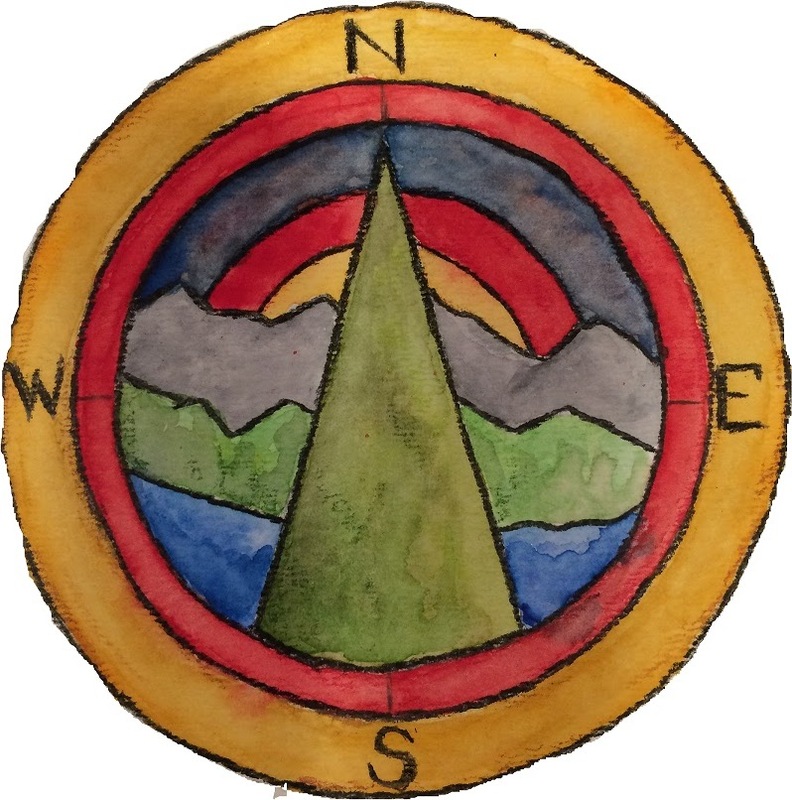 Now I’m designing a signature compass for each author. We thought the symbol melded well with the idea of the blog. A compass gives us direction when we’re lost. It’s a tool that helps us move forward even if we don’t know exactly where we are. It keeps pointing to our true north. I also like the fact that it’s circular in shape, like a mandala. How do you about designing work for other people versus for yourself? It’s a circular process. I ask questions about what they envision, what symbols and colors are important to them, and ask for examples of what styles they prefer. I then sketch a few visual examples. 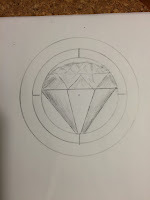 I share these sketches, request feedback, then make my revisions. It usually takes at least three cycles of sample-and-feedback to create a look that resonates with what the person was thinking. 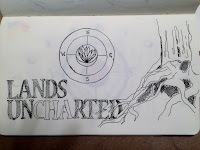 Here are some sketches that I shared with the Lands Uncharted authors as we were developing their concept. Tell us a little bit about your current work projects, WorkLife Lab and Doodlephilia. A few years ago I thought of the name “IntegrationArts” for a company that I’d love to have. It would be a place where people could meld their work and art. Well, two things have emerged under the “IntegrationArts” umbrella. One is the WorkLife Lab, designed for people re-creating, re-thinking, and re-framing their work. It’s really about the art of work, crafting your career, sculpting your job. I’m always developing new curriculum (my latest is on the topic of “Intrapreneurship,” or acting like an entrepreneur within your own workplace). I love to work one on one with people who would like to pivot or transition in their careers and also teach workshops. My latest endeavor is a website called “Doodlephilia.” It’s really expresses my love for the doodle, for having fun in art no matter what your age or ability. It’s about art as PROCESS versus PRODUCT. Art [can be used] to learn, meditate, share, create community, play with new ideas, or to just lighten up, have fun, and try a new perspective. The idea started from my past experiences using art to study and later to relax on business trips. You can check out both programs at www.worklifelab.net and www.doodlephilia.com. Both have access to fun, free stuff, so take a look. What illustrators and artists do you admire? Oh my gosh. There are so many!! Some of the illustrators I’m looking at now are Paula Zagarenski, David Wiesner, Gail de Marcken, and Graeme Base. I love the quirky and phantasmagorical illustrations gathered by Jeff Vandermeer in his book, Wonderbook: The Illustrated Guide to Creating Imaginative Fiction. Perhaps the most ambitious work that I turn to again and again are illustrations and script contained within the St. John’s Bible commissioned by the St. John’s Abbey and University in Collegeville, MN. It was a team effort, created by the calligraphers, illumuninators, and artists led by artistic director Donald Jackson (with much prayer and input from those at the abbey). Below are some links I’ve found to some of the illustrators. But search for art and illustrators that speak to YOU, tug at your heart and bring you to life. Then begin to make your own. Pay attention to the PROCESS and worry less about the PRODUCT. It’s what art does to you that’s most important.